Asked about the promotion of the White Sox' young first baseman in early August 1990, White Sox GM Larry Himes said they did so because the club needed a bat, The Chicago Tribune wrote. That young first baseman was Frank Thomas and he rewarded that confidence in just his second game, hitting a two-run triple against Milwaukee. "Frank adds that dimension of power to our lineup," Himes told The Tribune of Thomas' promotion from AA Birmingham. "I've watched our ballclub the last four or five days and decided we needed pop." And Thomas gave them pop. He gave them pop over much of the next 16 seasons, winning consecutive MVP awards in 1993 and 1994 and five All-Star appearances. When his career was finally over in 2008, after 19 total seasons, Thomas had amassed 521 home runs. He also tallied more than 1,700 RBIs and a career batting average of .301, numbers that in 2014 won him induction into the Hall of Fame. 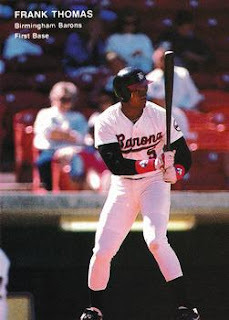 Thomas' career began in 1989, taken by the White Sox in the first round, seventh overall, out of Auburn. He played that first year between rookie ball and single-A Sarasota. He played his second between AA Birmingham and major league Chicago. After his early-August call-up, Thomas played 60 games for the White Sox, hitting .330 with his first seven home runs. He also earned his permanent home as the White Sox lineup, infield and history. In 1991, Thomas hit 32 home runs in 158 games. He also hit .318. On June 24, he hit his first career grand slam. It was also Thomas' first grand slam since high school. Going into 1992, the talk was about Thomas' pitch selection. In 1991, he drew 138 walks, the most in the league. In four of his first five years, Thomas led the league in walks. "I just learned to be patient," Thomas told The New York Times in March 1992. "If a pitch isn't in the strike zone, I'm so picky I won't swing the bat." Thomas' first MVP award came in 1993. He hit 41 home runs, with a batting average .317 as the White Sox made the playoffs. His 37th home run of the year tied the team record and marked Thomas' 100th. As the seasons went by, Thomas continued to solidify himself in Chicago sports lore. He won his second MVP in the strike-shortened 1994 season with 38 home runs and a .353 average. In 1996, 1996, 2000 and 2003, Thomas hit 40 or more home runs. Through 2000, Thomas only hit under .300 once, in 1998. In 1997, he won the American League batting title, hitting .347. As 2001 came, injuries caught up with Thomas. He got into only 20 games that year, 74 in 2004 and, the year the White Sox won the World Series in 2005, Thomas got into only 34 games. In 2001, it was a torn arm muscle. In 2005, it was a broken foot. Throughout his accomplishments, Thomas was never tainted as others were. After hitting his 500th home run, Thomas said that made the accomplishment that much more meaningful. "It means a lot to me because I did it the right way," Thomas told The New York Times. "I could care less what others have done." Thomas hit that home run as a Blue Jay, playing his final three seasons with Toronto and Oakland. In August 2010, after Thomas finally called it quits, the White Sox honored his contribution to the team by retiring his number, No. 35. At the ceremony, Thomas became emotional. "Eighteen years in this game and 16 full ones here," Thomas told ESPNChicago.com later, "it brought back a lot of memories, thinking about all the teammates and all the great times, good and bad times. It just got to me. I was emotionally caught up. I'm a very proud man and this probably was the proudest day of my life." Thomas had another proud day Jan. 8, 2014, with his induction into the Hall of Fame on the first ballot, garnering 83.7 percent of the vote.